Located in Biervliet, a little town in the Dutch province of Zeeland near the Belgian border, Pladdet is an experienced manufacturer of attachments and an accomplished excavator modifier. As an attachment supplier, Pladdet’s track record dates all the way back to the mid-1970s. roughout the decades, high-quality excavator buckets and demolition and sorting grapples have remained Pladdet’s core expertise. However, this is about the only thing constant with the ever evolving Dutch company. By 2014 when PDi first visited Pladdet’s headquarters the manufacturer had cemented its position as a leading supplier of excavator attachments in the Benelux, and was preparing a full on onslaught on the international market. At the time Pladdet was a mid-size company with some 60 staff on its roster. Four years on, this number almost doubled on the back of increased production and sales volumes. In order to accommodate the heightened demand, Pladdet embarked on a facility expansion project in November 2017. Having taken almost ten months to complete, it resulted in the total building footprint being expanded from 7,500 m2 to 10,000m2, with the outside area also being increased by 5,000m2. It was not only Pladdet’s manufacturing facilities that have got bigger in the past few years. The company’s attachment portfolio was also enlarged to include a range of plate compactors and a scrap shear series. Europe currently accounts for the lion’s share of Pladdet’s sales, with Benelux, Scandinavia, Germany, the UK, France, Switzerland and Austria being the major customers. Outside its home continent, the supplier has high hopes for India where it just started operations. Productwise, demolition and sorting grabs are still the bestselling items in Pladdet’s catalogue, followed by hydraulic breakers and a range of static and rotating pulverisers. Over the course of the last four years the company’s turnover has increased from €24M to €30M. Pladdet does not sell its attachments directly to contractors, preferring instead to concentrate on widening its dealer network. As part of this strategy, the Dutch company will be exhibiting its products at bauma Conexpo India this coming December, and next year at bauma, Munich. According to Pladdet’s managing director Jonathan de Putter, the company’s eventual target is having some 40 dealers and importers all over the world, supplying attachments to end users. 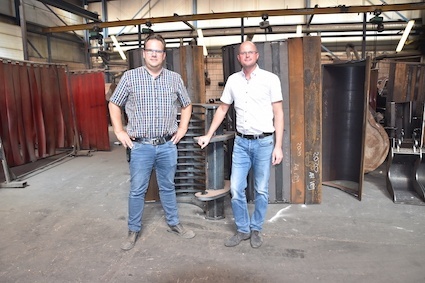 When asked about the industry trends, Jonathan de Putter commented that Pladdet, as an official distributor for SMP Parts tiltrotators in the Benelux market, sees a growing demand for tiltrotators equipped with GPS sensors. As for Pladdet’s own products in the pipeline, design work for a rail-cutting shear is currently underway, with the launch slated for next year.